Location, type of terrain and type of usage are all key to selecting the right snowshoe equipment. 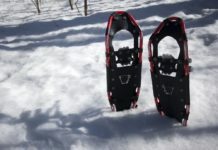 With greater numbers of people heading out to experience this winter sport for fun or fitness, it is important to understand the basics of finding the right type of snowshoe. Snowshoes have come a long way since the rawhide beavertails used for centuries. The use of aluminum frames and synthetic materials for webbing has resulted in a wide array of lightweight and durable snowshoes on the market. The wood and rawhide of old-fashioned snowshoes took a long time to dry and were prone to damage that could be onerous to fix. Modern snowshoes are simple to care for and the materials used allow snow to slip off easily and dry quickly. Being so lightweight also makes them easy to transport. Snowshoes can be purchased at most sport and outdoor retail outlets and cost anywhere from $100-$300. There are basically three types of snowshoes: recreational, mountaineering, and racing. Each snowshoe is designed to deal with different types of use and terrain. Select the recreational type for basic hiking in gentle terrain and groomed trails. If heading out for a hike in the backcountry with steep climbs and descents, go with the mountaineering snowshoe. Racing snowshoes are for those wanting to get serious about the sport of snowshoe racing. The mountaineering and racing snowshoes are smaller to better navigate through difficult terrain and add speed, while recreational snowshoes are wider to provide stability on flat areas. Each type comes in different sizes to accommodate different weights, with the snowshoe getting wider for larger people to better distribute their weight. The addition of crampons at the toe, heel or ball of the foot greatly improves traction, making movement through difficult terrain easier, especially on hills. Bindings vary but will easily fit over most boots and are simple to use. 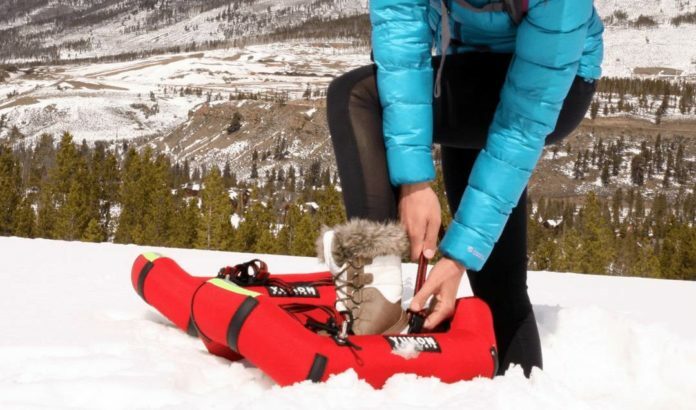 Gaiters will greatly improve a person’s snowshoeing experience because they prevent snow from getting into the boots and prevent the calves from getting soaked from the snow being kicked up with each step. Telescopic poles can be used to snowshoe and will increase the workout while providing help on the hills and flat areas. Waterproof gloves are also an asset. Make sure to dress appropriately for the weather in clothing that breathes and moves. Selecting the right snowshoe will ensure a successful introduction to the sport. It is a good idea to test out different varieties by renting them at a ski resort before purchasing snowshoes. With the right equipment for the right use, becoming a fan of this wonderful winter sport is a sure thing.